2015 DE Keisean Lucier-South tweeted out his Top 5 earlier this week. No surprise that Michigan makes the cut here. The coaching staff has already made the pass-rusher a priority for 2015. Although that it’s no surprise that Michigan is on the list, it is surprising that neither USC nor Notre Dame made his Top 5. I firmly believe that KLS’s recruitment will come down to a battle of UCLA and Michigan. 2016 WR Benjimin Victor released his Top 15 on Monday. The 2016 wide receivers recruitment has been hard to read lately. He’s been real quiet on twitter, but has visited multiple schools over the past month including; Ohio State, Florida State, Auburn, and Tennessee. As of right now, I would consider Victor a bit of a pipe-dream, as he is likely to end up playing his collegiate career in the SEC. And just like that, all hopes of a Damien Harris reunion are squashed. Personally, I was kind of shocked Michigan didn't even make the list. Although it's rare to have a recruit re-commit, the feeling around most Michigan fans was that they would at least still have a shot at landing the five star prospect. Harris who seems like an Ohio State lean as of right now, will make his college decision on December 13th. Although I like Michigan's chances of landing Weber, if he was to commit to a different school, the running back situation for 2015 looks bleak. Most of the offered running backs have committed elsewhere, and other than Kirk Merritt and Jacques Patrick, there isn't many prospects with interest in Michigan. 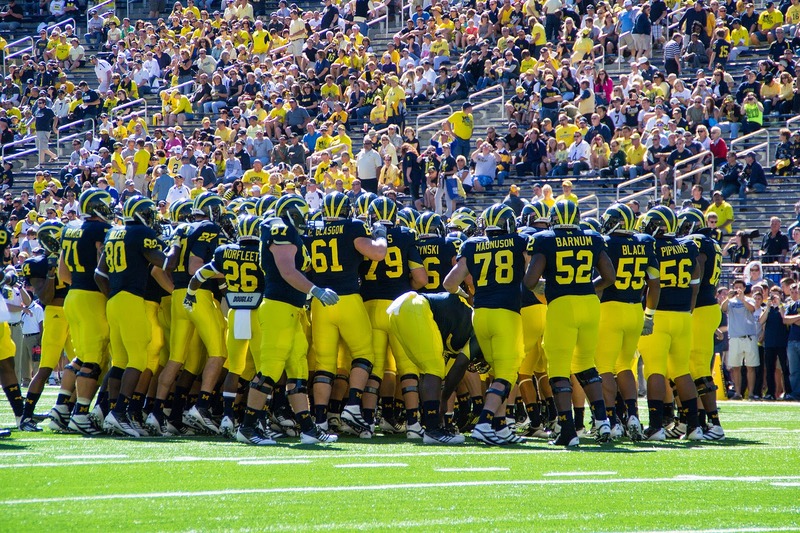 Michigan could also choose to not take a running back in 2015, and take two for 2016. The Wolverines will be getting a visit from a major target next weekend in 2016 running back Kareem Walker. The 5 star running back from Wayne, New Jersey already boasts a very impressive scholarship offer list from many top programs across the nation including; Alabama, Penn State, Auburn, Florida State, and Ohio State. Although this is Kareem’s first visit to Ann Arbor, look for current Wolverine and New Jersey native Jabrill Peppers to accompany Walker on his visit. Kareem is currently ranked as the #1 running back in the nation according to Rivals.com, and was the first running back Michigan offered in the 2016 recruiting cycle. He is currently being recruited by Roy Manning. Rivals.com released their 2016 football player rankings earlier this week. Both 2016 Michigan commits made the list, as did many of their top targets. #134 WR Brad Hawkins Jr.
2015 CB Marcus Lewis has officially decommited from Florida. Marcus took to twitter to make the announcement on Monday afternoon. I am officially announcing my decommitment from the University of Florida. I am grateful for the opportunity the university granted me. 2016 OL Auston Robertson was offered a scholarship after attending the BBQ last weekend. 2016 WR Cam Chambers picked Michigan State over Michigan on Friday afternoon. This is a great pick-up for the Spartans. Chambers, who was at the Big House BBQ last weekend, is ranked the #7 WR in the Nation according to Rivals.com. So where does Michigan turn to now? Austin Mack, Dylan Crawford, Justin Layne, Josh Imatorbhebhe are all high quality receivers that have high interest in Michigan.